Friday morning, I woke up in Andrew’s childhood bed. We stayed at his parent’s, to soak up all of the time we could with his sister and brother-in-law. I went home, made breakfast and headed to Body Alive for a hot yoga class. After running six miles and drinking on Thanksgiving, a good sweat-sess was exactly what I needed. The sweet potato hash with Apple Gate Chicken Maple sausage links and avocado have been on repeat. The hash is super simple to make. I shred a large sweet potato using the large holes on my box grater. Once it’s shredded, I melt a large tablespoon of coconut oil in a pan, add a few handfuls of sweet potato and a shake or two of sea salt. I cook the hash over medium heat, until crispy. I stopped at Trader Joe’s before class, to stock up on my weekly must-haves. I picked up my staples; plantain chips, Apple Gate smoked turkey, bacon, chicken apple sausage, sunflower seed butter, coconut milk, black beans, Tiki Masala simmer sauce (can’t wait to try this) and wild Sockeye salmon. Trader Joe’s is right down the street from the yoga gym. I put my groceries in backseat and headed to class. I got there ten minutes early and the place was already packed! I found a place next to the mirror and settled in. After class, I stopped at Kroger to pick up the rest of my weekly haul; rotisserie chicken, sweet potatoes and salsa. I went home, unloaded my groceries and got started on my Friday chores. I did a couple of loads of laundry, cleaned up my apartment and worked on the blog for a bit. After a while, I worked up an appetite. And because I am the most creative, Fake Chipotle! Friday night, we planned to celebrate Andrew’s 30th. We went over to his parent’s to open gifts and then headed to dinner at the Incline Public House. We ordered a round of drinks, to celebrate the birthday boy. I had a Tito’s and soda while they tried a couple of the beers. The IPH has a diverse menu, filled with plenty of gluten free options. I had my eye on the burger. I subbed the onion straws for a fried egg and fries for a the Enright salad. The rest of the fam ordered pizzas and salads to share. Saturday, we slept in a bit, finally waking up to get started on breakfast. I helped by making a quick fruit salad and prepping sweet potatoes. We all stood around the kitchen, talking and sipping on coffee as the food cooked. 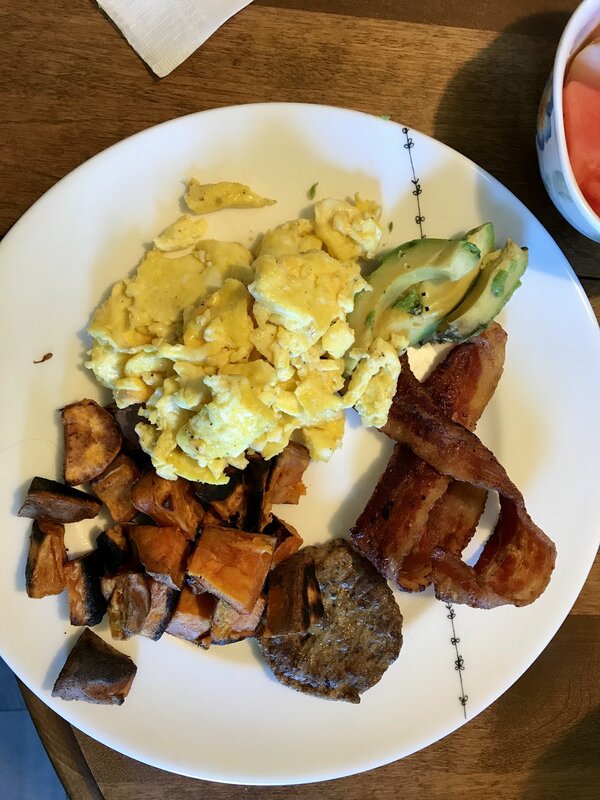 We had quite the spread; bacon, sausage, geotta, eggs, sweet potatoes, fried potatoes, avocado, toast and fruit. I grabbed a little bit of everything. After brunch, I went home and took a long walk. It was really nice outside and I had a couple of podcasts to catch up on. Sunday, I had a case of the scaries. I woke up early but ended up hanging on the couch, watching episodes of ‘The Office’ before finally getting up. I ran a couple of errands, buying ingredients to make ‘Lara Balls’ and picking up eggs to make yet another hash. This time with a fried egg on top! It was another nice day. Instead of driving to the gym, I decided to walk. I bundled up and pressed play on Ted Radio hour. The walk is two miles and takes me about 30 minutes, which is the perfect amount of time to get through a podcast. I listened to ‘Maslow’s Human Needs’, as I soaked up the sunshine. When I got to the gym, I made up a quick workout. I started with chin ups, then I did three sets of five burpees, 15 weighted squats and five pushups. Then, I did 5x5 of deadlifts at 110 pounds and a various of leg press movements. It felt good to move some weight around. After that was all said and done, I walked myself home, listening to the other half Ted Radio Hour. Since I had a late breakfast, I wasn’t super hungry when I got home. Instead of waiting for hunger to hit, I snacked on a couple of turkey roll-ups and some plantain chips. Thanks to the ‘Get Your Period Back’ program, I’ve learned the important of fueling your body before and after workouts. In the past, I would have waited to eat when I was hungry. Now I understand that’s it’s important to keep my hormones in check by fueling my body. After a couple of hours, I was ready for another snack. I threw fresh berries and Purely Elizabeth granola into a plain KiteHill yogurt. If you're looking for a quick gluten and dairy-free snack, this is a good one! I had a couple of items left on my to-do list this weekend. I headed to Lens Crafters to get my glasses adjusted, picked up a Christmas gift, dropped off some items to my local Snooty Fox and Goodwill. Then, I went home, wrapped said gift and got started on Sunday meal prep. When that was all said and done, I hunkered down to finish the last module of the “Get Your Period Back’ program.